From Kellisa's Path, with Laurel: I Hate Irresponsibe Dog Owners! I really do hate irresponsible dog owners while out on the trail. Read that first sentence again before sending any messages or leaving comments. I hate irresponsible dog owners. I don't hate all dog owners or dogs, just irresponsible dog owners. Read on to see how I define irresponsible. Most, if not all trails that allow dogs require them to be under control and on a leash. I know there are dog parks that allow dogs to run wild, so you have places to let your dog be free and a trail which requires a leash is not the place for many reasons. Too many times we've encountered dogs not on a leash and they come running up aggressively. Sometimes the dogs are face level or even higher than the kids which scares them...and me. The most common response from these owners is laughter, "Oh, they're harmless" or "They're part of the family". The owners need to know their laughter doesn't help us feel any better or safer. Keep your dogs under control! 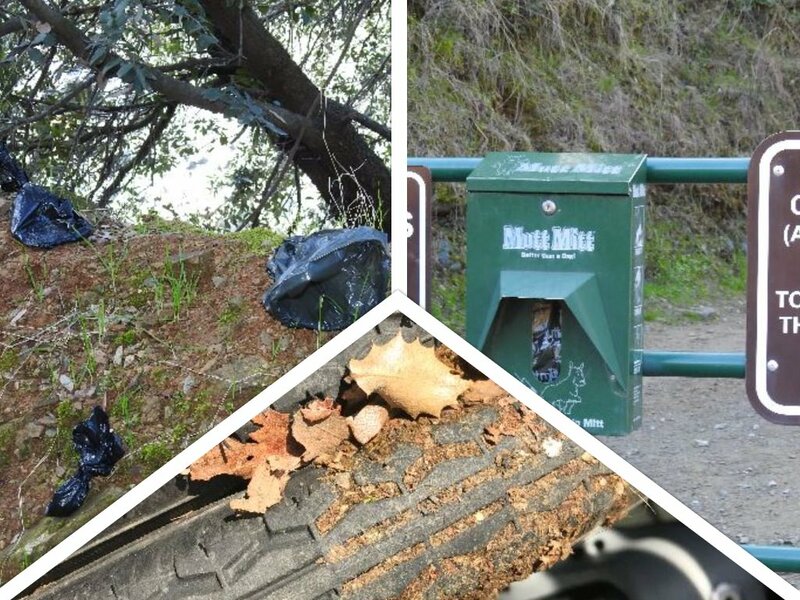 Another pet peeve about irresponsible dog owners- at the trailhead to our recent hike of the Mountain Quarry Railroad Trail, there was a nice little box with baggies (Top right picture) for dog owners to use for their dog's waste. A large boulder (Top left picture) not far from the trailhead seems to double as an open air trash can for the whole world to see and smell while out trying to enjoy nature. To make matters even worse, not all owners cleanup after their dogs leaving a mushy mess on the trail. Unfortunately, with all the leaf debris covering the trail, we wheeled (Bottom center picture) through a well camouflaged pile of dog waste. This is impossible to thoroughly clean from the tire treads while out on a trail which means we need to load the smelly tires in the car for the ride home. Once home, I need to use the hose to spray the disgusting mess from the tires. Our only silver lining is Kellisa doesn't have to use her bare hands on her soiled tires to propel herself. Not every wheelchair user is that fortunate. Think about that for a minute.